This is the perfect first time juice as it’s relatively easy to get used to the taste. 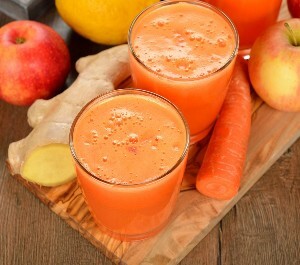 Tip: Fruit juices are great for overall health. At first it takes a little time to get used to the taste, but eventually you’ll get there…. Just think of all those health benefits! Another tip is to mix your fruit juice with a little natural apple juice (juice apples along with the veggies) to give it a sweeter taste. Juice according to juicer instructions and enjoy! Carrots are rich in betacarotene which is good for the skin and eyes, as well as the immune system. Ginger can help with morning sickness, nausea and also migraines.